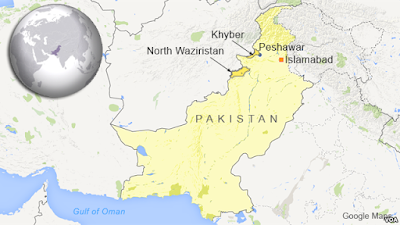 (Pakistan) Airstrikes by the Government on Friday killed at least 20 militants including key commanders in Khyber Agency. The bombardment by jets during Operation Khyber II also injured 18 other terrorists. (Afghanistan) An airstrike by Afghan aircraft on a couple of vehicles carrying terrorists in the Eastern Nangarhar province of the country saw 8 of them killed. Weapons and 8 bodies were recovered from the scene. (Syria) Lebanese terrorists and thugs for Iranian hire 'Hezb-allah' today reported that in 2 separate attacks they have killed 9 ISIS idiots inside Syria. Both attacks took place in the chaotic Qalamoun mountainous region near Syria, where ISIS is trying to expand its operations. In the first attack, ISIS commander Abu Aisha al-Libi and six other terrorists were killed as they held a meeting at Khirbet Hamam to plan an attack against the eastern city of Baalbek, In the same Khirbet Hamam area, Hezb-allah terrorists also destroyed two military convoys, presumably of ISIS. Another ISIS commander, named as Abu Akrama al-Zouhouri, along with ISIS terrorist Ahmad Abed al-Mohsen were said to have been killed in that attack. (Israel) It's Friday (the Islamic holy day) during the Islamic holy month of Ramadan where even thinking bad thoughts aren't allowed, and in the West Bank a Palestinian decided to fire upon 2 Jews simply because they were... Jews. One man has died and the other has been rushed to hospital. (Iraq) Iraq’s Defense Ministry released a statement on Friday in which it said “at least 124 Daesh (ISIS) terrorists” had been killed in air operations carried out in the Anbar, Kirkuk and Saladin provinces. At least 47 other people, including 39 Daesh militants, were killed – and 23 others injured – on Thursday in separate attacks across Iraq, Iraq’s Interior Ministry said. Minus the 23 I posted yesterday, this comes in at 140. (Egypt) It appears that the Muslim Brotherhood is still willing to allow its supporters to die for the cause in which to promote this view to the West that actually they are all little lambs who wouldn't say boo to a ghost. Which is why a young man was killed on Friday in clashes between Egyptian police and the Brotherhood in the hometown of their locked up leader. Ramadan death toll is now at 298.